Send someone a Happy Saints Gift Coupon! Use them to purchase Happy Saints eBooks. Each coupon comes with a printable gift card. Available in US$10,$15 and $30 certificates. After you purchased a gift coupon*, a 10-digit coupon code will be sent to you through email. You will also receive a link to download a printable gift card (sample designs above). Replace the red text in the gift card with the coupon code. Print out card, cut along dotted lines and send to recipient. Alternatively, email the gift card to the recipient. 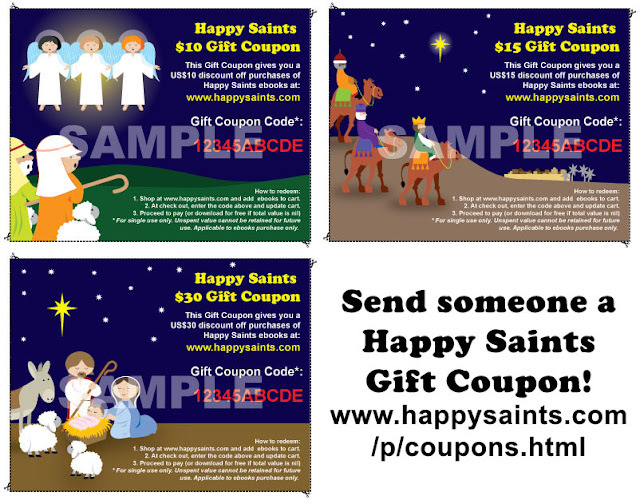 The recipient shops at www.happysaints.com and at check out, enters the coupon code to redeem the discount. * For single use only. Unspent value cannot be retained for future use. Applicable to ebooks purchase only. Happy Saints Gifts for Christmas!